With the continued support of our volunteers, we've made great progress in clearing the Broad Brook Opera House. With our seats and other belongings packed away safely, we're nearly ready for the end of our lease, which is up at the end of August! Even though we’ve been a little bit quiet, we have been hard at work behind the scenes planning and prepping our new home for our upcoming renovation. We officially signed the agreement with the Town of Enfield on April 17th and since then we have contracted with an architect and have begun to map out the plans for our new theater space. Plans include a much larger stage area, increased seating capacity, more bathrooms and full handicap accessibility. Working within financial and time constraints (to be able to be open with our first show in November), we have developed a first phase and second phase of renovation. Drafts of the architect plans will be posted soon! Jeff, our OHP Facilities Manager, has also been hard at work prepping for the renovation! Jeff removed a platform that uncovered the beautiful original chancel of the church.. 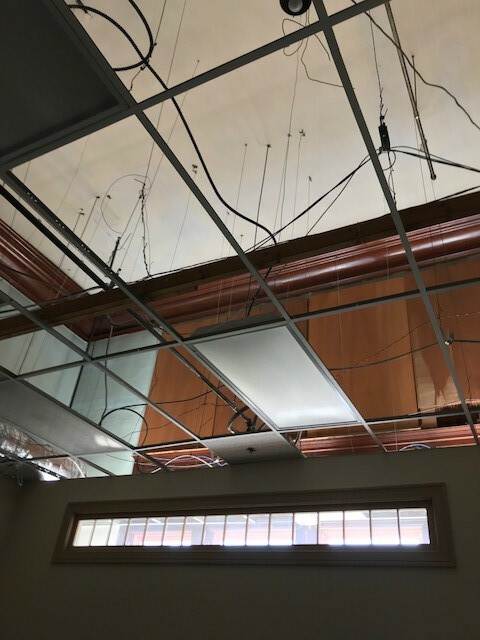 He also removed the drop ceiling so that the architect and engineer can do measurements. In the process, he uncovered 20 foot ceilings and beautiful moulding. Many thanks to all our volunteers for their hard work!